This Shield Security Sign Kit is also available in a smaller 12x12 size, recommended for smaller areas. 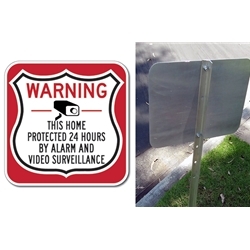 Use this 18x18 Shield Security Sign kit to let everyone know your home or business is protected. This kit includes 1 Shield Sign, 1 Heavy Duty Sign Stake and mounting hardware! DOUBLE the working life of your Shield Security Signs by adding 3M Protective Overlay Film (POF)! 3M’s high-tech POF protects sign faces against fading caused by the sun and harsh weather—and makes graffiti and sticker defacement damage easy to clear away without harsh abrasives.